I am not normally a big fan of wet, cheesy dishes, particularly if they are likely to contain large amounts of improperly cooked potatoes. Unfortunately, this includes almost all varieties of potatoes au gratin, which can be tasty but are often poorly done. Despite my general reluctance to make this type of a dish, this Leite’s Culinaria won me over with three simple things. First, it included artichokes, which I love. Second, it did not have a huge amount of cheese or cream. And, finally, it was baked in a loaf pan rather than a more traditional casserole. I took the liberty of replacing some of the cream with milk, which probably won’t surprise any regular readers, but with only a few tablespoons, it doesn’t make a huge difference in the turnout of the recipe. It does save a few grams of fat and a couple extra calories, though. There were not quite as many artichokes as I would have liked, but by thinly slicing them, I think that I got a fairly even distribution throughout the dish. I used canned artichoke hearts, packed in water, instead of cooking and slicing fresh ones, which saved quite a lot of time from the original recipe. It also turned out that I needed fewer potatoes. Though I did use the soft, buttery Yukon Gold variety, mine must have been large than the ones used by the recipe author, since I only needed about 4, not 6, to fill my pan. I cut the potatoes very thin, aiming to keep all slices at about 1/8 inch (3mm) thick. The thinner your slices are the less likely your final dish is to have any undercooked potato bits. The resulting dish was slightly creamy, without being too wet, with tender potatoes and a hint of GruyÃ¨re. I was actually very happy with the amount of cheese in the dish, though a few more tablespoons wouldn’t hurt if you’re a big cheese lover. I baked it slightly longer than the recipe called for, testing it with a sharp knife to ensure doneness. I loved how this could be served in neat slices, rather than messy scoops, too. In a small saucepan, conbine cream, garlic, salt and pepper. Bring almost to a simmer, stirring to ensure salt is dissolved, and set aside. Peel and slice potatoes into 1/8 inch (3mm) thick slices. Brush an 8×4 inch loaf pan with the olive oil. Layer 1/3 of the potatoes in the loaf pan, top with 1/2 of the diced artichokes and 3 tablespoons GruyÃ¨re. Repeat with next 1/3 of potatoes, the rest of the artichokes and 3 more tablespoons cheese. 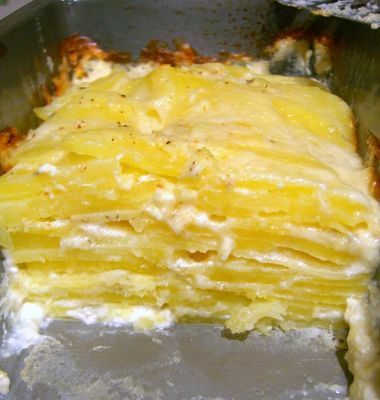 Top with remaining potatoes and cheese. Pour cream mixture over everything, cover with foil and bake for 45 minutes. Remove foil and bake for 10-15 additional minutes, until the top browns slightly and a knife inserted into the potatoes comes out easily and cleanly. Cool for 10-15 minutes before slicing. Makes 4 main course servings or 6 side servings. This looks fantastic. I love anything with potatoes and artichokes! Mmm mmm. I have to say I’m a big fan of anything wet and cheesy, but not very often. Tends to leave you feeling a bit like collapsing on the couch in a stupor. Like you, I’m very anti crunchy potato in my oven-baked potato stuff. Just awful. Have you tried the potato gratin in Jeffrey Steingarten’s book (might be the second one?). He comes up with the definite version, after trying something like 20 different versions. I’d sounds fantastic.